I whipped up a batch of Reeses Stuffed Peanut Butter Chocolate Chip Cookies. They’re pretty much the most decadent, wonderful cookies you can ever imagine- especially if you’re a lover of chocolate and peanut butter! Watch the video showing you how to make these cookies, then scroll to the bottom of this post and print out the recipe so you can bake them at home. This cookie recipe was inspired by my friend Jenny. She’s the queen of stuffing chocolate chip cookies. I don’t know whether to love Jenny or hate her. 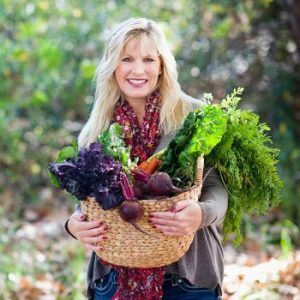 My family cannot stop eating these, despite our extreme efforts to eat healthy these past few months! Despite my hesitations, I wouldn’t hesitate at all to make these Reese Stuffed Peanut Butter Chocolate Chip Cookies again and again. They are absolutely a most wonderful sweet treat. 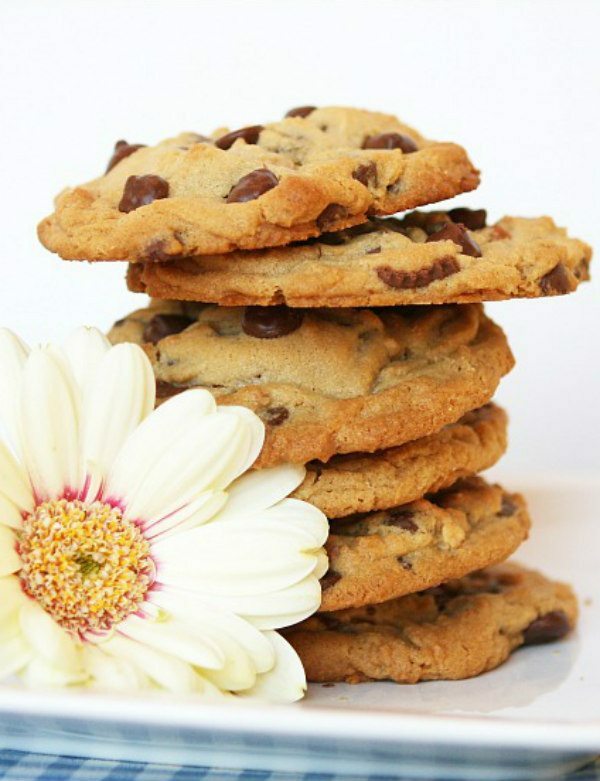 One cookie is all you will need for dessert. In fact, you may even wish to cut the cookie in half and share it with someone else! Start with one heaping tablespoon of dough…smashed down with the criss-cross of a fork. Top with a full-sized Reeses Peanut Butter Cup. I like to freeze the peanut butter cups so they’re easier to work with. Add another big scoop of dough on top of that! Use your fork to sort of criss-cross the top and smoosh everything down a bit. Then sprinkle a few additional chocolate chips on top to make everything look pretty. The dough will come down around the peanut butter cups while baking, to create a classic looking chocolate chip cookie. 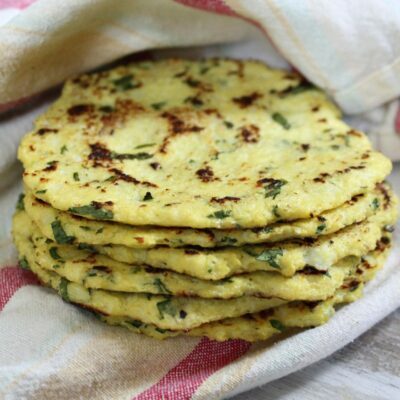 These 4 to 5-inch bad-boys bake up in about 12 minutes. You’ll get twelve large cookies out of this recipe. They’re a tender cookie (not crunchy, but certainly not cakey), and when you bite into one… you’ll most certainly discover the surprise of the Reeses Peanut Butter Cup baked inside. Fun fact: I once made two dozen of these cookies for an elementary school fundraising auction. Someone took them home for a $50 bid! I hope you like milk… you’ll need quite a few swigs of it to wash down all of this decadence. 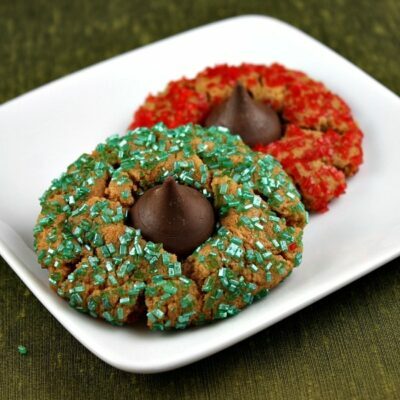 We don’t often swoon much over cookies at our house, but my family went nuts over these. If you’re looking for more recipes using peanut butter cups, you might also enjoy my Oatmeal Peanut Butter Cup Chocolate Chip Cookies or these Peanut Butter Cup Cookie Cupcakes. Peanut Butter Cup Magic Cookie Bars, Chocolate Peanut Butter Cup Cheesecake Cake and Dirty Brownies are also great recipes starring peanut butter cups! 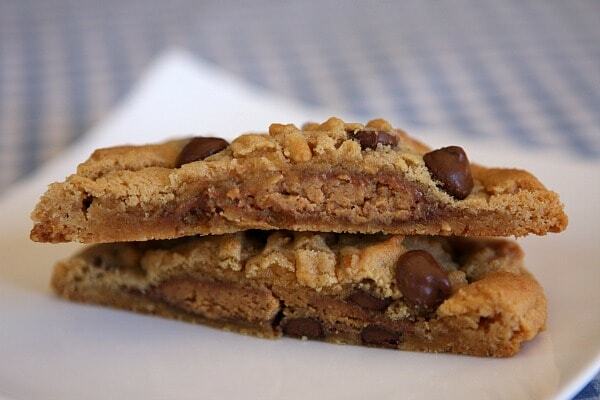 These Peanut Butter Chocolate Chip Cookies have a full-sized Reeses Peanut Butter Cup hidden inside of them! Preheat the oven to 350 degrees F. Line baking sheets with parchment paper or silpat baking mats (or spray with nonstick spray). In a large bowl, use an electric mixer to cream together the butter, peanut butter and sugars. Add the egg and continue to mix until light and fluffy. In a medium bowl, whisk together the flour, baking powder, baking soda and salt. Add the dry mixture to the wet mixture. Stir together just until the dry ingredients are incorporated. Stir in 1 cup of chocolate chips. 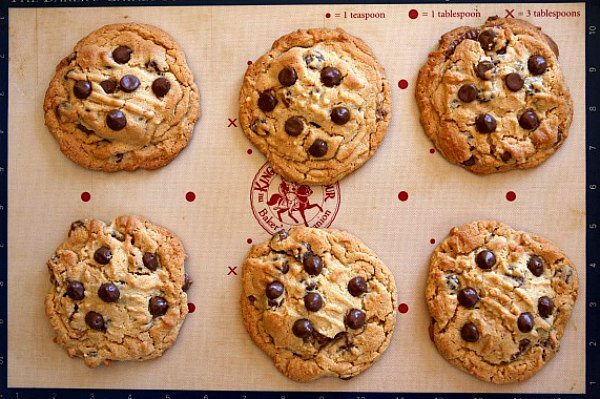 Plan for baking 6 to 8 cookies on a large baking sheet. Scoop out a heaping tablespoonful of dough and place it on your cookie sheet. Use a sugared fork to make a criss-cross on the dough (to smash it down a bit). Top with a Reeses Peanut Butter Cup. The top with another heaping Tablespoonful of dough (so that the PB Cup is sandwiched between two scoopfuls of dough). Use a sugared fork to criss-cross the top and make sure the dough is covering most of the PB Cup. Stud a few extra chocolate chips on top. Repeat with remaining cookie dough and PB Cups. Bake for about 12 minutes, until cookies are lightly browned and almost set. A little tip for measuring peanut butter... spray your measuring cup with nonstick spray first, then scoop the peanut butter in to measure. It'll slide right out of the cup, without sticking! These cookies freeze well. Throw individual cookies in sandwich-sized zip baggies and toss them in the freezer for times when the mood for cookies strikes. Absolutely the best cookie I have ever had! I did use some suggestions of other reviewers and added 1/2 tsp of vanilla and turned the reese cup upside down to make it easier to cover. I also cut the reeses to do a half in each cookie so that I could make smaller cookies for kids. Also agree with another reviewer that this is a great chocolate chip cookie recipe too if you didnt want to do the candy. Thank you so much for sharing Lori! I made these for a camping trip and they are AMAZING! 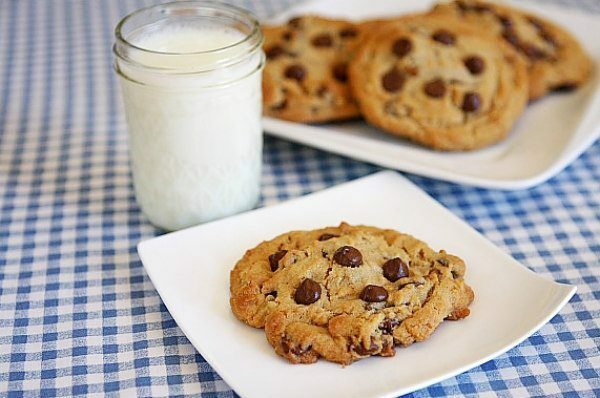 Not a cookie to eat regularly (you are really eating 2 large peanut butter chocolate chip cookies AND a peanut butter cup-calorie and fat alert! ), but they sure make for a fantastic treat! I will definitely make these again. NOTE: I put the peanut butter cup upside down onto the first cookie and this made it easy for the second amount of cookie dough to cover it. Holy Mother of Jesus. 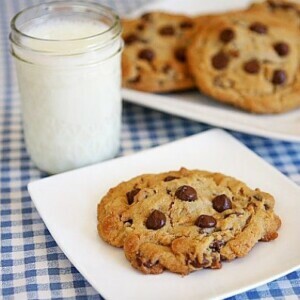 This is seriously the best chocolate chip cookie recipe I’ve ever tried. 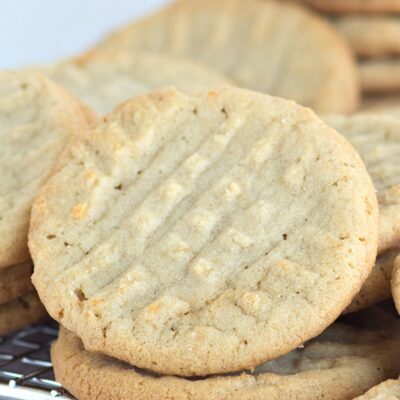 Sure, the peanut butter cup is such a majestically beautiful addition to them, but these cookies are perfectly crunchy on outside and slightly chewy on the inside. 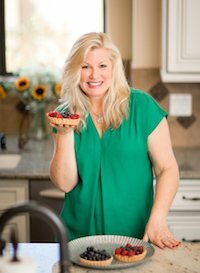 I’ve been looking for a perfect recipe for months– maybe even years. My taste buds were having an orgasmic experience. A thousand times I thank you! 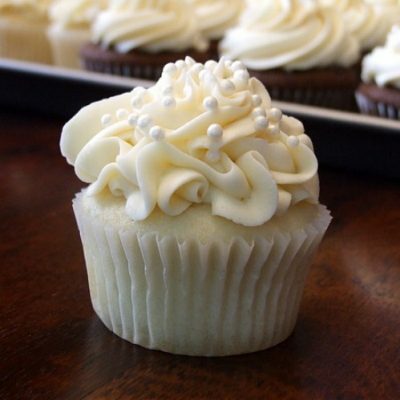 Just made these for a work function…brought milk…everyone LOVED them. I made extra, for selfish reasons, and a coworker suggested a brilliant idea. Ice cream sandwiches. These would be perfect. Thank you for the recipe! 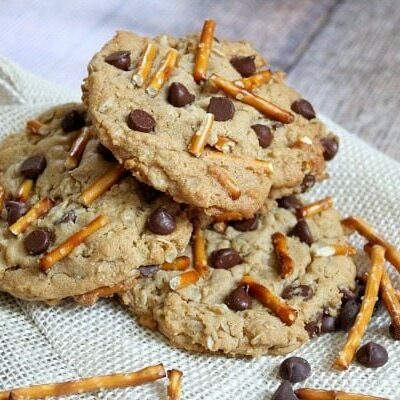 Just made these and the person who wrote in about mixing the dough too long is correct it dries out and is very hard to work with … also happens towards the last few cookies … but the cookies are great … only takes one to make this chocoholic say enough!! Great recipe, hope my son’s boy scout troop enjoys them this evening. I cut the peanut butter cups in half to make a smaller cookie. Worked great! 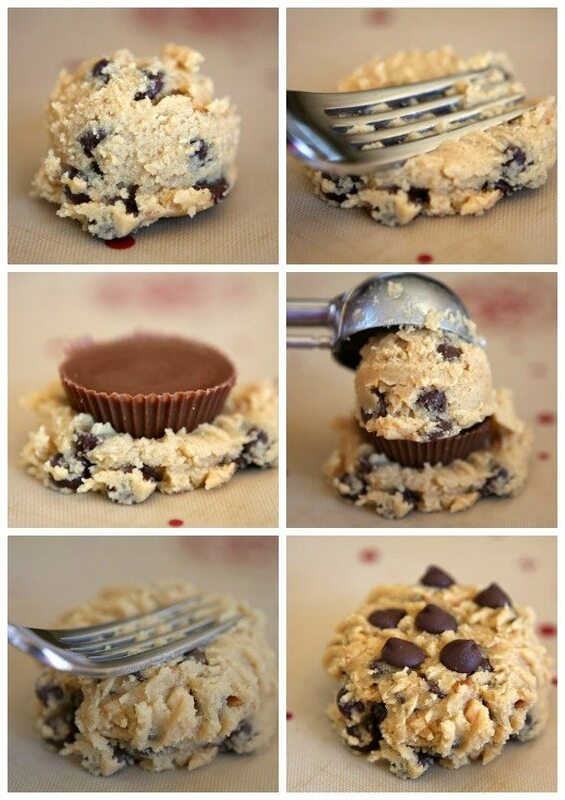 So I’m probably asking a silly question, but can this recipe be altered for the mini reese’s? They’re taller (obviously, and I’m wondering if i could just mold the dough around them .. but they’d come out taller … Maybe squish them a bit on the baking pan with a fork? Hehe, any insight you have would be helpful. Thanks so much! Sure! 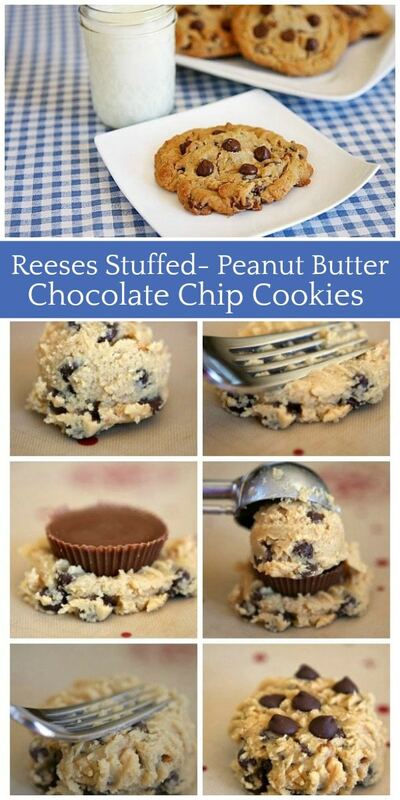 Or chop up the Reeses and just make Reeses- Chunk cookies instead! hope they taste as good as they look. Sometimes when you over-mix things, they can turn out tough or hard. Always mix *just* until combined, then stop mixing. Also, watch the time on baking. 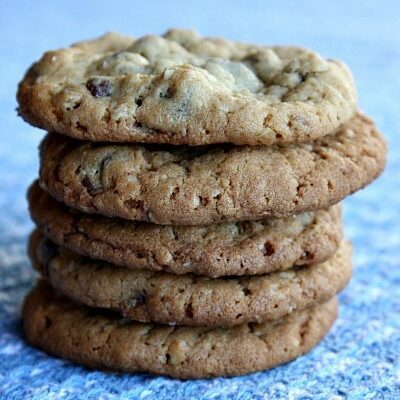 Cookies that are baked slightly too long become very crunchy cookies, and since all ovens vary with temperature- always check on them a few minutes before the indicated time on the recipe. Good luck! I made these for my boyfriend, who loves peanut butter cups. They turned out delicious!! These look heavenly! I can’t wait to give them a try! These bake up even better than the photo shows – light, chewy, uber-peanutty. My guy went bonkers for these. I added a bit of vanilla and a pinch of cinnamon to the dough. A keeper for sure! I can’t believe that these are even real! (I mean that in the best possible way). My favorite combo in the world is peanut butter and chocolate. These are going on my to do list for the weekend! These cookies look great. I plan on making them tonight. What an awesome tip with the cooking spray and peanut butter! I always have a huge problem with pb sticking to the measuring cups! @Vicky, Happy to help 🙂 Hope you enjoy those cookies!